Trying to find remote control robot toys for kids can be tough. There are so many options available online that is can quickly become overwhelming trying to find the one that you think your child would enjoy playing with the most. That’s why we’ve researched what the best options have to offer. We’ve saved you from doing the hard part and put the top choices into a reviewed list below. You can learn about the main features, pros, cons, what age the toy is recommended for, as well as what makes it stand out. A buying guide section is also available at the end to provide you with additional information. By the end of this review, you’ll be feeling confident about your final decision. 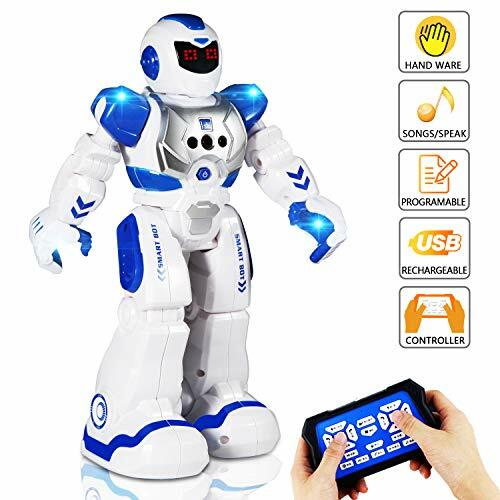 The Play22 Remote Control Robot Toy comes with a total of 10 different features that are available for kids to play with and have hours of fun. It includes LED lights that flash which are super exciting and stimulate your child’s visual senses. There are also missiles that can be shot and the the toy can dance, walk, and slide. Therefore, there’s plenty of things going on for kids to play with and be able to play with a lot of imagination. They provide kids with 9 missiles to shoot which they can have a lot of fun with using in their pretend play scenarios. These missiles are made out of soft foam materials to ensure your child’s safety. They are also easy for younger kids to use. Children have a blast playing with this toy and being able to incorporate the different moves, flashing lights, and missile-shooting function into their games. 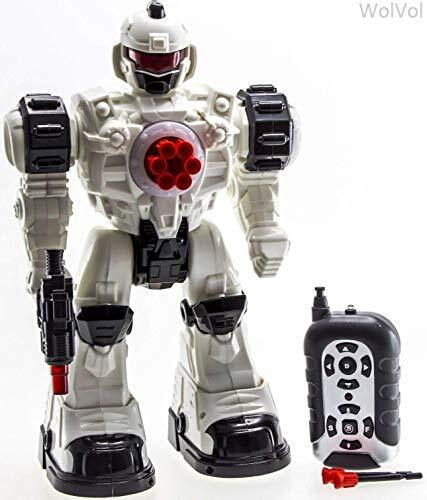 The RoboShooter Robot Toy is a ton of fun for kids to play with in a group of friends and family. It comes with discs that are made out of safe foam materials and can be shot from the chest of the toy. Kids have a blast controlling the toy and chasing people around shooting discs at them. We liked how the controls are super easy for kids to use. Therefore, they can start playing with the toy right away and have a blast. The toy can walk, dance, and even talk. These features are very exciting and ensure that kids are able to play with a lot of creativity. Kids can even program this robot toy to move around and fire discs, without needing to control it. This feature is excellent for helping kids to learn about the basics of programming, which is highly educational. Kids have a lot of fun using this robot toy to play creatively with friends and family. We were impressed with how it teaches kids about programming too. The Mibro Really Rad Robots toy features a remote control that kids can use to speak through. So, if the robot is on one end of the house, kids can speak through the controller and whoever is near the robot will hear their voices. This leaves the possibilities for imaginative play scenarios wide open. So, you can be sure that kids will find lots of ways to play creatively with this one. In total, there are 50 different functions available. This is effective at keeping kids engaged for hours on end. There are sound effects available too. These are awesome for stimulating your child’s audible learning skills. You can also use the robot toy to hold various objects and carry them around. Kids love using the remote control to speak through the robot. It’s a unique feature that encourages them to play with a lot of creativity. The WolVol Police Toy is able to perform up to 10 different actions via the remote. Therefore, you can feel confident in knowing that your child will have a blast playing with this toy for hours on end. It can dance and walk around, which encourages kids to use it in more creative ways. We also liked how it comes with robot sound and light effects. This makes it super exciting for kids to play with. It also improves your child’s visual and audible learning skills. Kids have a blast using all of these different functions to play with friend and family. As a result, it can be a great way to develop your child’s social skills. Children have a blast using this set to play with a ton of imagination. This is a result of the sound and light effects, as well as the 10 different functions available. WowWee’s Chippies Robot Toy Dog – Chippette is a cute robot dog toy that kids have been loving. We were impressed with how it is very interactive and it enables kids to play with it for endless hours. They can pet the toy’s head and watch how it barks, sniffs, sneezes, or gives puppy kisses. The remote control that’s included provides kids with total control over the robot dog toy. They can use it to make the toy sing, dance, roll, or chase its tail. All of these functions are a lot of fun to play with and encourage kids to think with more creativity. We also liked how there’s a feature available that can detect intruders. This can make for some pretty fun games with friends and siblings. This is an awesome robot dog toy that’s super interactive and responds to how kids pet its head. They’re also able to command the toy with the controller to play in creative ways with it. 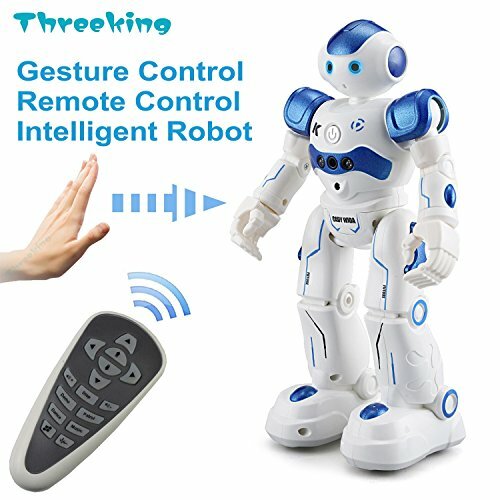 This Threeking Smart Robot Toys Gesture Control Remote Control Robot comes with a lot of fantastic features that kids have a blast playing with. It can move around on it’s own and avoid objects that are blocking its path, which is pretty impressive to watch. Furthermore, we liked how the toy can dance and have LED’s in the eyes that make it light up. It’s incredibly exciting for kids to play with and stimulates their visual learning skills. The multi-joint feature that’s available enables the toy to perform a wider range of moves, which means kids can watch how it responds in unique ways. The remote control can be used to control the dog. Alternatively, kids can program the toy to move around. Therefore, it’s an effective toy for teaching kids about how to program. We liked how this robot toy provides kids with the freedom to command it with the controller or by programming it. The controller is more fun to use and the programming is educational. This Boxer – Interactive A.I. Robot Toy comes with a range of 10 cards that enable kids to play for hours with their friends and have a blast. As a result, it can improve their social skills. 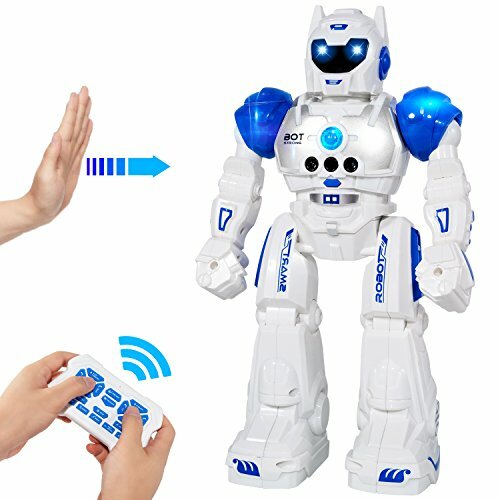 Children are able to use the remote control to play with this robot toy to make it do a range of different tricks. This way of playing is awesome for encouraging kid to play with more imagination and use their creative thinking skills. They can also choose to use their hands to interact with the toy. This is because it has been fitted with a number of sensors that are designed to follow your child’s commands. This method of controlling the toy is super interactive and exciting. 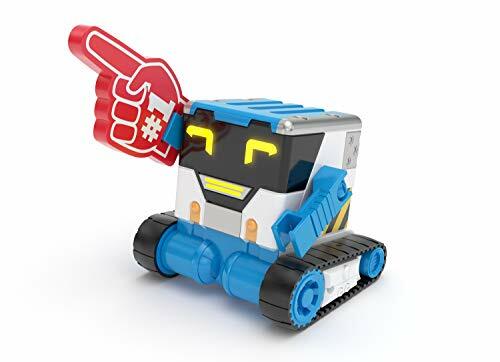 This is a fun robot toy that can either be commanded by the controller, or via your child’s hand gestures, which is an incredibly exciting way of playing. LEGO’s Mindstorms EV3 Robobt Kit with Remote Control is a lot of fun for kids to build. With this Lego Robot Kit there are 17 various designs available for kids to build, which means that they’ll be engaged with this set for a while. Building the various pieces is great for their motor skills and hand-eye coordination. We were also impressed with how there are various sensors that can detect touch and color. The remote control that’s available enables kids to control the various models that they decide to make, which is fantastic for their imaginative play abilities. However, they could also choose to use the EV3 programmer app that can be downloaded on a smartphone. This provides kids with the opportunity to learn more about how programming works. With 17 different robot models available to build, control, and program, you can feel confident in knowing that your kids will be entertained with this set for a long time. The WowWee Robosapien is an incredibly fun toy that kids have been having a blast with. It comes with fully functional arms that feature grippers. Therefore, kids can use the controller to make the toy pick things up and move them around. In addition to this, the toy also responds to voice commands, which is super interactive and fun for kids. We were impressed with how fast this toy is able to move around. 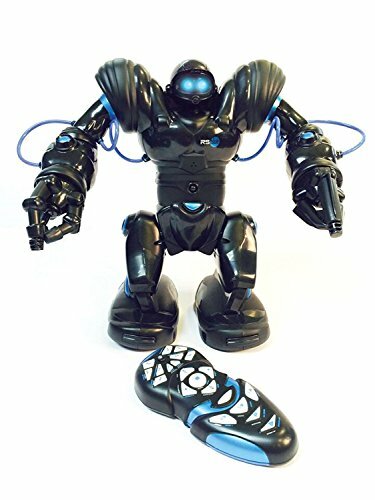 This makes it more fun for kids to play with as they can do more dynamic things with it, compared to slower robot toys. Kids can download an app on a smartphone and use it to program the toy on what to do. This is an awesome feature that teaches kids the basics of how programming works. Therefore, this toy is both fun to play with and educational. 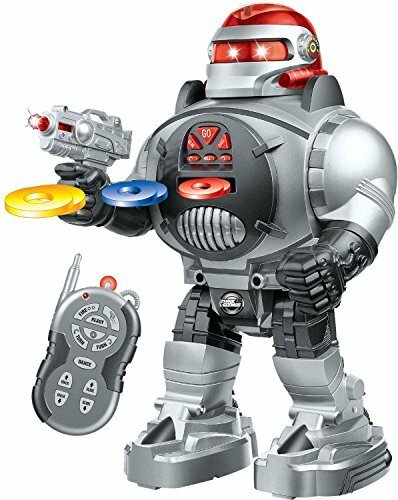 The voice command, dynamic movements, and programming features that are available with this robot toy make it a lot of fun for kids to use for hours of creative play. The AlLUKl Remote Control Robot toy can be commanded via a controller, as well a hand gestures. This is a result of the sensors that are built-in to the toy. As a result, kids can wave their hands in gestures and the robot toy will receive this information and move in whatever direction your child commands. We were also impressed with how this toy can be programmed. There is a total of 50 programmable actions available for kids to play around with. Therefore, you can be sure that they’ll have a blast playing with this one for hours. This is also an excellent way to teach kids about how programming works. Children have also been liking how there are eyes that have been fitted with LED lights. This makes the toy more exciting to play with and stimulates your child’s visual learning skills. Kids love using this toy to command it using either the remote control, programming, or their hand gestures. The different functions available make it super fun to play with for endless hours. The Top Race Remote Control Walking Talking Toy Robot comes with a range of 10 different songs that it can sing to kids. This is super entertaining and children have a blast singing along with the toy. It also has a number of LED lights available which make the toy even more exciting to play with. These lights are also awesome for your child’s visual learning skills. We were also impressed with how there are discs that can be shot by using the remote control. This enables kids to play with a lot of imagination as they can implement the shooting feature into their pretend play games. Children have also been loving how this robot toy can imitate their voices. It’s another highly interactive feature that they have a lot of fun playing with. The toy even dances and can give kids math quizzes. 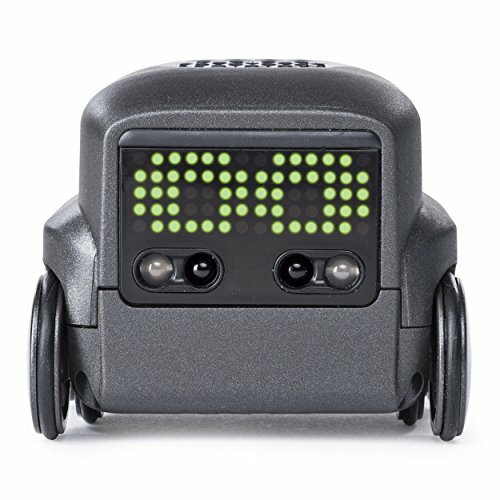 This RC robot toy is great for keeping kids entertained, with the dancing and lights, while also helping them to learn more about mathematics via the quiz feature. 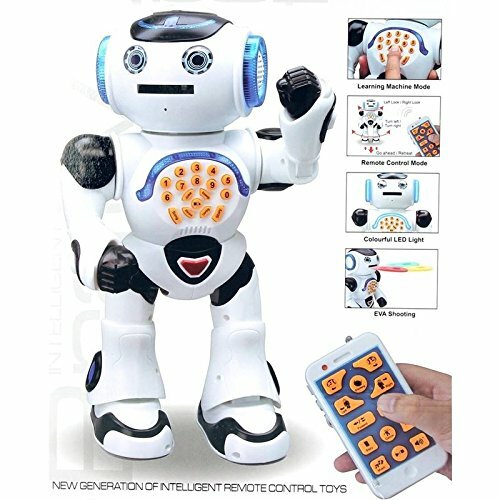 This MIBOTE Remote Control Robot Toys for Kids is able to sing and speak, which is super interactive and fun for kids to play with. They love hearing how it speaks and sings to them – it’s awesome for their audible learning skills. We also liked how this toy can work to teach children about science. As a result, it’s both fun to play with and educational. Kids have been loving the multi-joint feature as it enables the toy to move around in unique ways. You can also set a total of up to 50 different actions for the toy to perform, which is a blast for kids to experiment with. There is a gesture control feature available too which lets kids control the robot by using their hand gestures. This is a result of the sensors that are built-in to the toy. This is an awesome robot toy that helps kids to learn about science, while also being able to play with the toy in imaginative ways. 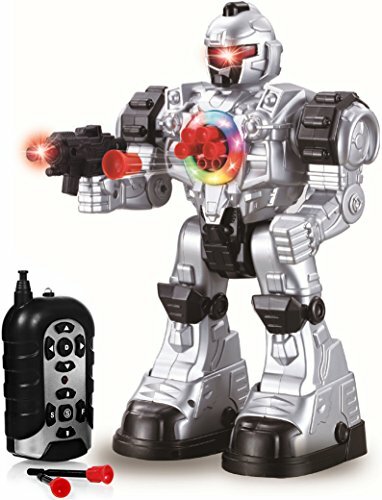 This Liberty Imports Large Remote Control Robot Toy for Kids is able to walk, dance, talk, and shoot missiles. Therefore, you can be sure that your children will have a lot of fun playing with this one for hours on end. We liked how the missile shooting feature allows kid to implement the toy into more of their pretend play scenarios. The walking, talking, and dancing features are highly interactive for kids as well. There are LED flashing lights included which are fantastic and work to stimulate your child’s visual learning skills. Kids love using the controller to move toy toy around in any direction they like. It’s something that they have a blast playing with along with their friends in small groups. Therefore, it can be effective at improving your child’s social skills. Kids have a blast using this toy to play with a ton of imagination for hours on end. The singing, talking, and LED lights available make it a highly interactive experience. 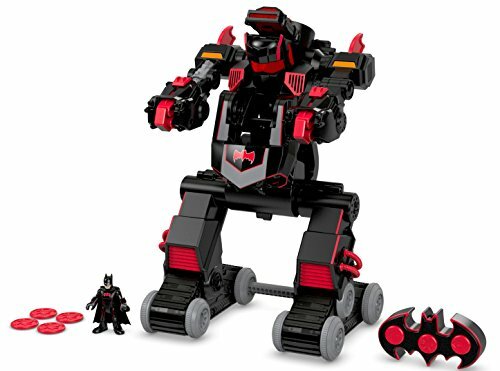 Fisher-Price’s Imaginext DC Super Friends RC Transforming Batbot comes with an impressive total of 100 different phrases and sounds. These are effective at stimulating your child’s audible learning skills. Furthermore, they ensure that kids are able to use the toy to play with a lot of imagination, which is great for their creative thinking skills. The remote control that’s available lets kids drive the toy in different directions to play freely. There is a rapid-fire disk feature which kids have been having a blast using. In addition to this, there’s an arm blaster that pops up and makes noises. The eyes of the toy also light up. So, there’s a lot going on with this toy to keep your kids entertained for hours of play. Kids who are fans of Batman have been having a blast using this toy to play imaginatively for hours on end. Now that you have a better understanding of what some of the best remote control robot toys have to offer, you can begin to narrow down your search to finding the one that your child would enjoy the most. If you’re not feeling completely confident on the one to choose, don’t worry. We’ve created this buying guide section to provide you with additional information that will make it a lot easier. After reading through the review above, you will have seen that there are various RC robot toys available. To learn a little more about these different types and what makes them unique from one another, take a look at the section below. There are some radio control robot toys that have cameras built-in to them. They allow kids to record and take pictures from the toy’s perspective, which can be a lot of fun. This also inspires kids to be a lot more creative when playing. Kids have a blast using these kinds of robot toys in their pretend play games. They can come up with scenarios that involve spying and using the camera attached to the robot to infiltrate different rooms. The possibilities for creative play with these types of robot toys are endless. Most of the options mentioned in this review are able to walk. Depending on the toy, kids can either use the remote control to make them walk, or use a setting to watch how it walks on its own. There are also toys that can be programmed to walk which are educational and exciting for kids to use. We’ve included a number of fantastic interactive cool robots in this review. These are the ones that have sensors fitted and can react to your child’s hand movements. They are incredibly accurate and work to pick up specific hand gestures that causes the toy to do certain things. This types of interactive feature can be thoroughly engaging for kids and keep them entertained for hours. Boys tend to love the robot toys that can fight. There are numerous toys in this review that can shoot foam discs and missiles and kids have an absolute blast with them. They love being able to implement the toy’s different battle features into their pretend play scenarios with their other toys. It’s an excellent way for them to develop their creative thinking skills. Hexapod robots are toys that walk on 6 legs. As a result, they tend to have a lot of flexibility which enables them to move around in more unique ways. This is a lot of fun for kids to play around with. They feel encouraged to use the remote to control the hexapod robot in fun and exciting ways, which is excellent for encouraging them to play with more imagination. Lego is a brand that is well-known for manufacturing high-quality toys, and their RC robot selection lives up to their reputation. The Lego Mindstorms toy that we’ve reviewed in this post is a fantastic choice as it enables kids to build their toy and play with it afterwards. As a result, your child is given the opportunity to develop their motor skills and hand-eye coordination. They’re also able to learn how to program which is another awesome benefit. Star Wars robot toys are a big hit among kids who love the movies. Therefore, if you know that your kids is a fan of the films, going with a Star Wars themed robot toy would be an excellent idea. Many kids love the Transformer movies and cartoons, and there are a number of robot toys that have the character designs. Similarly to the Star Wars toys, if your child is a fan of the movies and cartoons, they would have an absolute blast playing with a Transformer robot toy. We have made sure to include a number of options throughout this review that are suitable for a wide range of ages. If you were interested to learn more about these age ranges, you’ll want to take a quick look below. 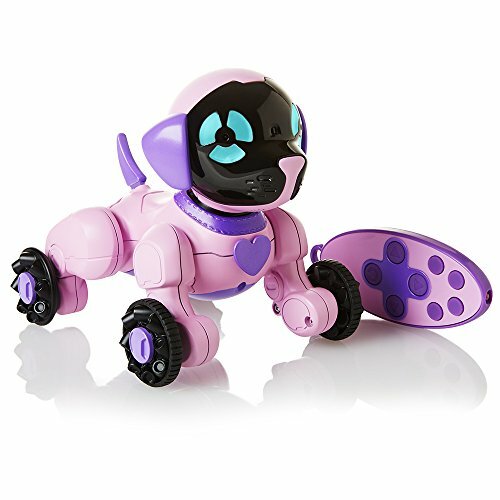 When it comes to finding robot toys for 4 year old girls or boys, you’ll want to go with ones that have a fun design. For example, the WowWee Chippies Robot Toy Dog – Chippette is a fantastic option because the dog design is a lot of fun for younger kids to play with. The Mibro the Really Bad Robots is an excellent choice for 5 year old boys or girls as it comes with a ton of great functions – 50 to be exact! Therefore, a 5 year old is able to be more stimulated and entertained by the toy. 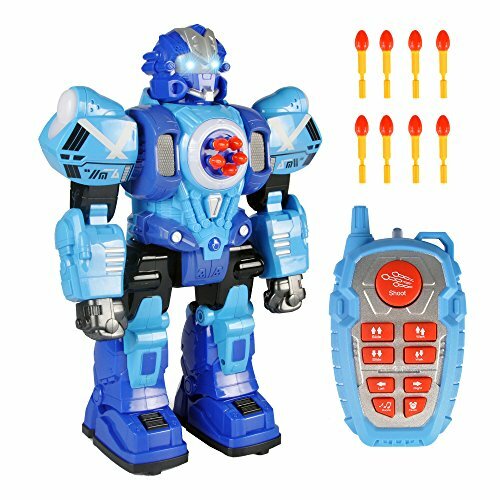 The WolVol Remote Control Robot Police Toy is a great option for 6 year old boys. Kids are able to use the remote to make it perform up to 10 different functions, which enables them to play in a variety of creative ways. 7 year olds boys have been loving the RoboShooter Robot Toy. One of the main reasons why they’ve been having so much fun with it is because it’s effective at teaching them the basics of programming. At 7 years old, kids are at the stage where they need something that’s more cognitively stimulating, and that’s exactly what this toy provides them with. The Threeking Smart Robot Toys Gesture Control Remote Control Robot is a superb choice for 8 year olds boys. It’s incredibly interactive due to the sensors that are built-in to it. This allows kids to use certain hand gestures to control the toy – not to mention, it teaches them about programming. Even 8 year olds girls love this and have more to focus on and play with when using these kinds of toys. We recommend the WowWee Robosapien for 9 year olds. This is because it comes with a voice command feature that may be a little too advanced for younger kids to get the hang of. Kids are also able to control it by using programming. The toys and gifts that encourage 9 year olds to play in new and inventive ways are going to be the best for their development and enjoyment factor. 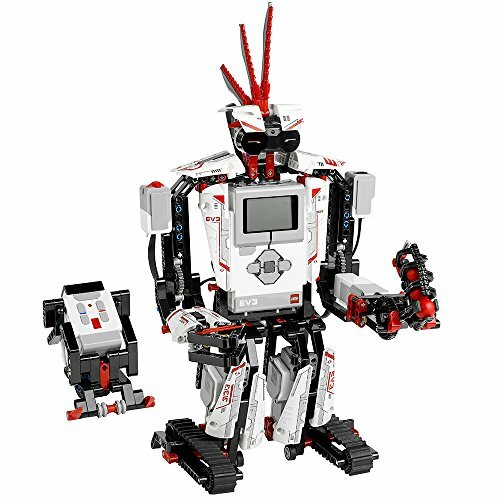 LEGO’s Mindstorms EV3 Robobt Kit is a spectacular option for 10 year olds. This is because it provides children with the ability to build their toy and play with it like an RC robot afterward. These types of robot toys are a lot more challenging, which is why they’re best for kids who are 10 years and older. The higher difficulty level stimulates their cognitive functions which is great for their development. 11 year olds are also able to benefit greatly from the LEGO’s Mindstorms EV3 Robobt Kit. The app that can be downloaded on a smartphone helps kids to learn about how programming works. So, these kinds of toys have more features that challenge kids cognitively, which is exactly what an 11 year old needs. 12 year olds have been loving the WowWee Robosapien. It can pick things up and move them around, respond to voice commands, and be controlled via programming. So, just like 11 year olds, these types of toy provide 12 year olds with more features to challenge themselves with. Hopefully, we’ve provided you with everything that you need to know surrounding the top remote control robot toys that are currently available. Be sure to read through all of the main features, pros, cons, age recommendations, and what makes each toy stand out. That’s what will leave you with the best idea of whether or not it’s the best choice for your child. The buying guide section can also be used to gain additional information if you weren’t feeling sure on which toy to select. Consider the age of your child and the types of features that are available with these toys that you think they would have a blast with!